CANADA – Edmonton - Archeologists have uncovered a palisade trench on the Epcor grounds that for the first time pinpoints the location of one of the early Edmonton fur trading forts. “That would make it one of the earliest non-native structures in the City of Edmonton,” said archeologist Nancy Saxberg, who excavated under the concrete floor of a 1950s machine shop in May and July as part of the expansion of the Epcor water offices and decommissioning of the power plant in the downtown river valley. What she found isn’t much to look at — a 50 centimetre-wide line of disturbed soil in a layer of silty, light-coloured sub soil that was ground level at the time of the fur traders. But it’s definitely a man-made trench and far too wide to be part of a house or other building, she said. It varied in depth from about 80 centimetres to one metre, with clear steps between them. Fur traders first arrived in the Edmonton area in about 1795, when the twin forts Edmonton House of the Hudson’s Bay Company and Fort Augustus of the Northwest Company, were built just across the river from what is now Fort Saskatchewan. The fur traders pulled up the stakes and moved both forts to the Rossdale flats at the beginning of the 1800s. Few details are known about the reasons for the move since the Hudson’s Bay Company journals for those years were lost, Saxberg said. 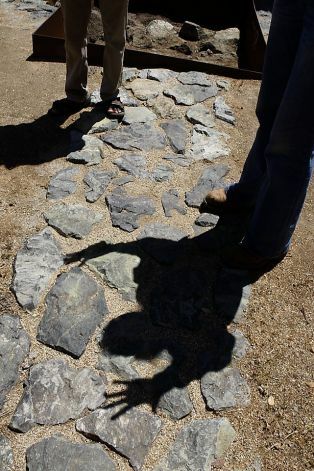 USA – San Francisco - The long-buried skeleton of colonial San Francisco is being brought to the surface at the site of the old Spanish fort in Yerba Buena, where California as we know it was born. Archaeologists for the Presidio Trust are building interpretive replicas of the ruins of El Presidio de San Francisco directly above the famous garrison's original stone and adobe walls. The displays will use the exact same construction methods and, where possible, materials that were used in the historic 1815 expansion of El Presidio, the ruins of which were recently uncovered. The foundation walls of the Spanish fort were discovered by the Army as it prepared for the 1994 transfer of the Presidio to the National Park Service. Workers were attempting to remove underground heating fuel tanks from a row of houses on Funston Avenue when they found stonework running along the backyards. The walls were outside the boundaries of the original 1776 garrison built by the Spanish, but subsequent archival work revealed that El Presidio had been rebuilt in 1815 after the original structure was severely damaged during earthquakes in 1808 and 1812. 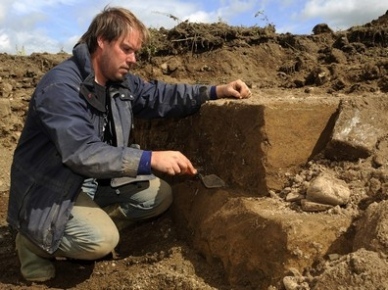 ROYAUME UNI – Papcastle - Almost £400,000 has been secured to fund a major excavation of a key Roman settlement unearthed during the 2009 floods. The discovery, at Papcastle, near Cockermouth, is one of the largest Romano-British settlements ever found in northern England. The well-preserved remains of a Roman Settlement were revealed in the aftermath of the November 2009 floods that devastated Cockermouth. The Roman fort at Papcastle was known to the Romans as Derventio. Although the fort site has been subject to excavation in the past, the full extent of the associated settlement lay undiscovered until the floods of 2009, which brought a wealth of Roman artefacts to the surface. These finds prompted Grampus Heritage to undertake an initial community archaeology survey, confirming that Derventio was far more extensive than previously thought. These limited excavations revealed substantial stone and wooden buildings, roads and enclosures as well as many Roman artefacts including pottery, metalwork, coins and glass. The discovery of the most complete Roman water mill yet recorded in Britain was a major highlight. SYRIE – Alep - Clashes between rebels and government forces in the ancient Citadel of Aleppo, a UN World Heritage site, damaged one of the stone footbridges that lead into the fortress, eyewitnesses in the embattled city said on Friday. Syrian archeologists today published photos and a video of the damage to the Citadel on their Arab-language Facebook page titled Syria's Endangered Archeological Heritage. 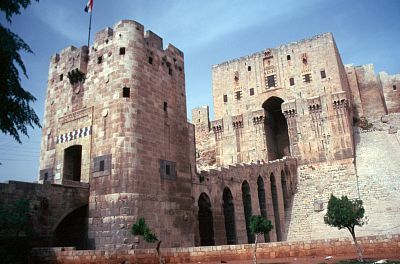 The video shows Syrian government tanks lining up at the Citadel, and a group of soldiers crossing the damaged footbridge into the fort near its first guard tower. The Syrian National Council, which is the main opposition platform within Syria and abroad, today accused government forces of damaging an unspecified section of the Citadel with mortar fire. But according to Strasbourg-based Syrian archeologist Ali Cheikmoush, who is documenting and denouncing the damage being inflicted on Syria's monuments, the footbridge was damaged in a raid by Free Syrian Army insurgents, who blew up one of the gates to get into the fort in search of snipers. USA – Lower Elwha - Lower Elwha Klallam people stood at their sacred creation site last month for the first time in nearly a century, the tribe announced last week. In addition, the park service also reported finding a site in a nearby location that documents human use as far back as 8,000 years ago, establishing it as one of the oldest known archaeological sites on the Olympic Peninsula. The creation site is a rock with two deep depressions that was covered by water behind the Elwha Dam after it was built in 1913. Oral tradition and recorded reports dating as far back as 1919 describe the rock as the place where the Creator bathed and blessed the Klallam people and other tribes, said Jamie Valadez, Klallam language instructor. 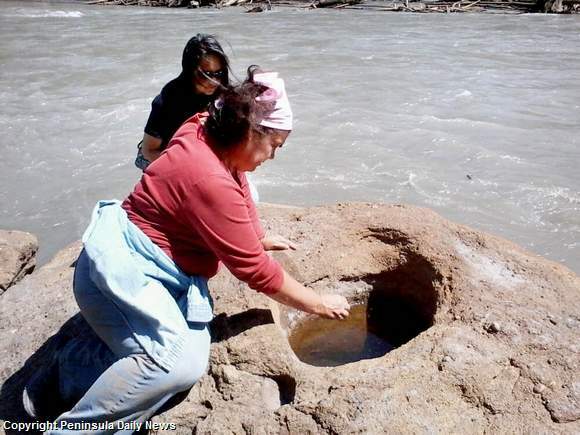 Radiocarbon analysis of a second “culturally sensitive site” found recently on the Elwha River showed that people had lived there as far back as 8,000 years ago, according to Olympic National Park officials. The second discovery is one of the oldest known archaeological sites on the Olympic Peninsula, the park said. Material from the second site was collected for further study, and the site was reburied. Like the creation site, it was recently discovered in an area that had been covered by one of the two lakes that had been behind the dams.